In this project, an advanced, configurable Solid State Protection System with additional features will be developed using CoolMOS. Why CoolMOS C7 is used in this project? Following are some of the few demonstration how CoolMOS can be used in different applications to serve "not only as a switch but also as a fast protection and fault interrupting device". Events like overload, short circuit, over/under voltage for DC, overload and over/under frequency for AC can be detected with this solution. These protection schemes are user configurable to meet different application scenarios. Automotive auxiliary system consists of Lighting, Door/Window Control Motors, Window Wiper, Heater etc. These loads may become faulty and create short circuit on the battery power distribution system. Instead of using regular blow fuse to protect car batteries, CoolMOS can be used to implement Smart Fuse. Smart Fuse restores itself once the fault is cleared. A combination of comparator, current sensor and Interrupt makes the fault detection super fast. As CoolMOS is an automotive grade solution, it is suitable for this purpose. This device can be used In DC Homes, to keep track of energy consumption and interrupt short circuit events. Therefore, serving as the purpose Energy Metering and (C/B) Circuit Breaker together. Faulty condition like under/over voltage which may be harmful for the DC loads or overload/short circuit which is damaging for the source can be detected with this solution. CoolMOS acts as a safe power switching & fault interrupting device. Industrial applications use Magnetic Contactors for switching high power loads. Since CoolMOS has higher Voltage/Current spec, it can easily replace Magnetic Contactors in many applications. 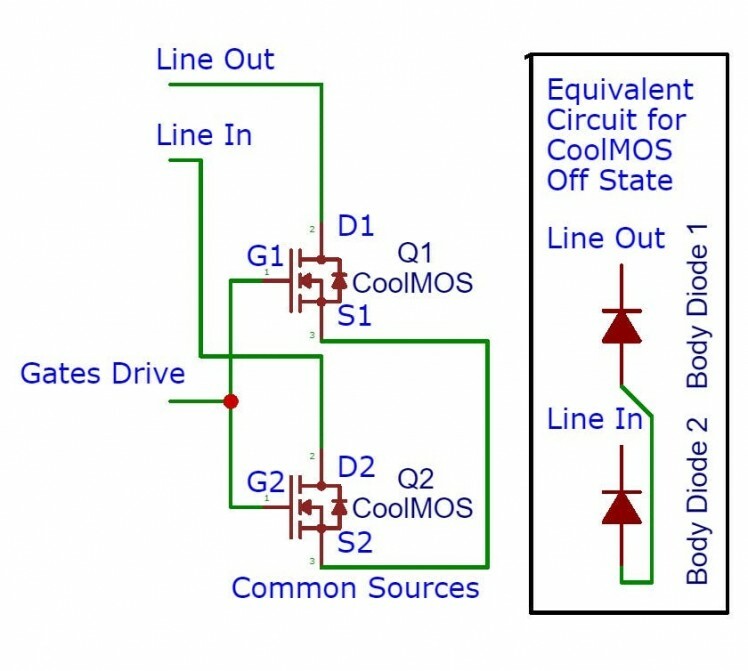 This example demonstrates, how CoolMOS based Solid State Relay can switch AC power. The switching is performed at Zero Crossing of 230V. 50 Hz AC, also knows as Soft Switching for which CoolMOS C7 is ideal. The load was 100 Watts incandescent light. Lastly, a short citcuit was emulated by pressing the trip button. 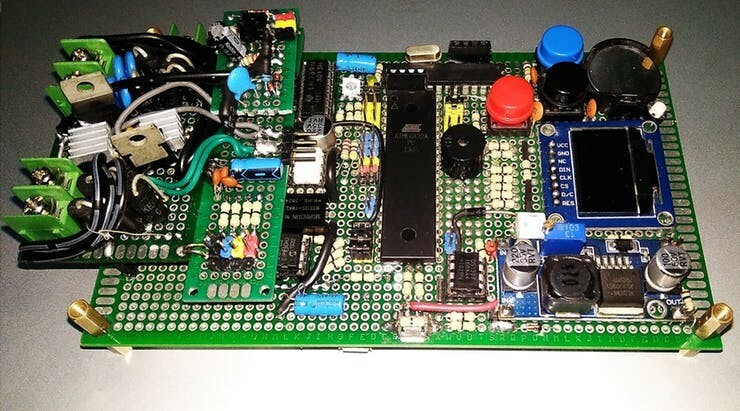 The solution is developed around a custom development proto board which has an Atmega32A microcontroller (MCU) as the system controller. A 128X64 pixel 1306 OLED display for monitoring parameters, 3 push switches for user input and a buzzer for alarm makes the UI section. It is programmable through Bluetooth<->Serial (or USB<->Serial)modules which interfaces with the on board ISP programmer ( Atmega8A/Atmega328P programmed as Arduino as ISP ). The ISP programmer programs the Atmega32A chip through SPI interface. 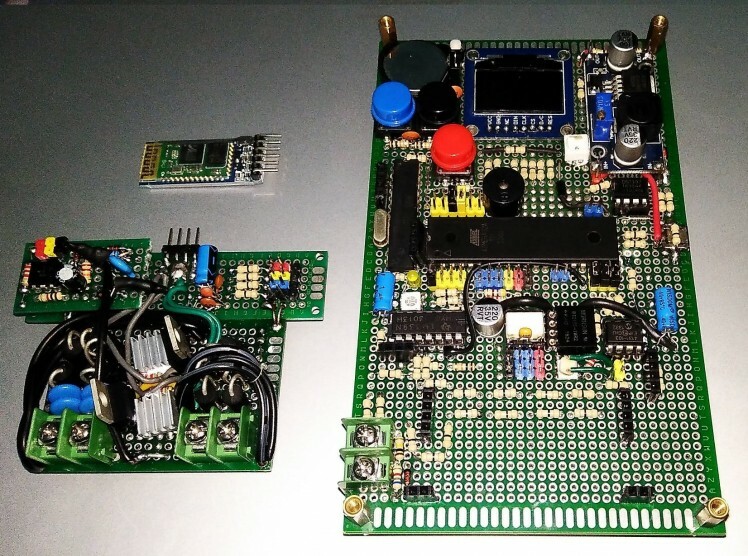 One of the painful part of hardware prototyping is that, it requires connecting the development board to PC and program it again & again until a working firmware is ready ! 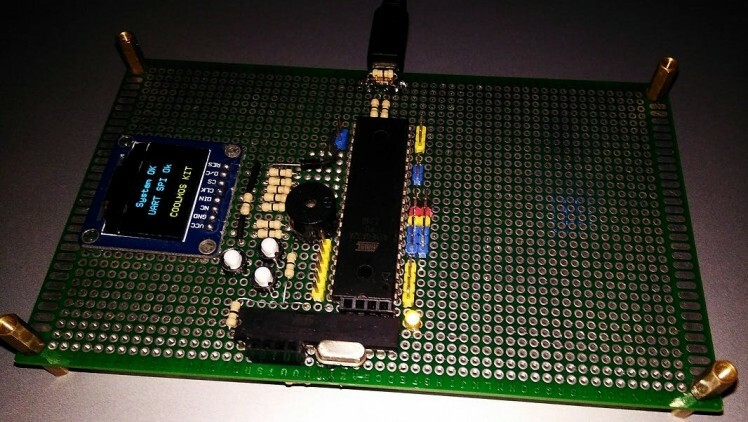 Remove the programmed Atmega328P chip from Arduino board and solder it on the Development Board of this project. After completing both steps and putting both the modified HC-05 & Atmega328P*** programmed to act as ISP programmer on the development board according to this circuit diagram, now the development board is ready to code. MOSFETs are by default unidirectional switch, in a sense that the other direction will always conduct through body diode inside the MOSFET. So, it won't work as a switch on AC or reversed polarity DC. Then, this configuration will be able to switch and block both AC/DC. Since, both the gate pins are tied together, when both MOSFETs are Off, the body diodes inside the MOSFETs will form Back-to-Back configuration, which can block current even for AC/Reverse Polarity DC. Since, CoolMOS has a high Vds of 650 Volts, this configuration can easily handle standard 110/230 VAC and 5/12/24/48/120/240 DC systems. 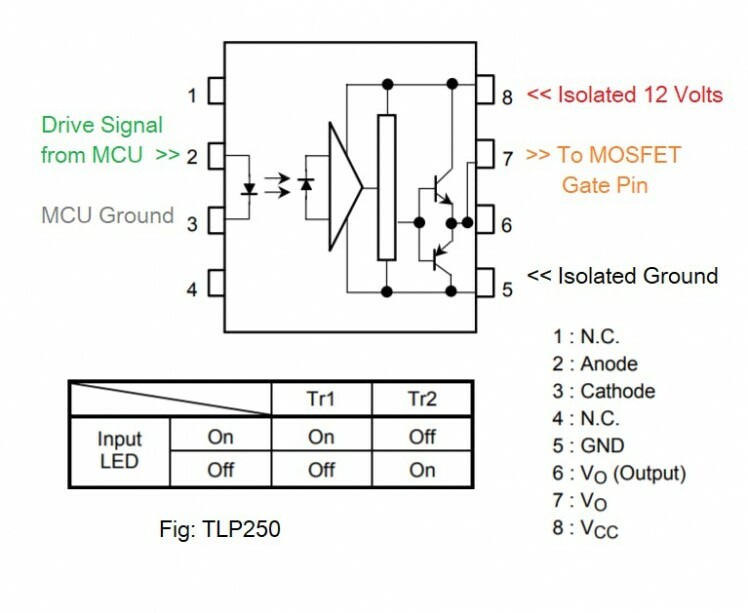 When, positive gate drive voltage is applied with respect to source, both MOSFETs will turn on and current will enter through one of the drain pin (coming from supply side) of the first MOSFET and exit through the other drain pin (going to load side) of the second MOSFET. It does not matter which direction this current is flowing, as long as Vgs is above the threshold voltage. In this project, the control voltage level is 5 volts ( for muc, display, sensors etc) but the controlled voltage may be as high as 600 VDC or 400 VAC. That's why, every interface between low voltage side and high voltage side must be isolated. If something goes wrong, isolation will prevents high voltage getting into low voltage side as there is no direct conduction path. Isolated sides don't share common ground and prevents interference on Digital circuits from Power circuits. To turn on CoolMOS properly, 12 volts Gate to Source voltage should be good enough. But this gate drive voltage must be isolated. 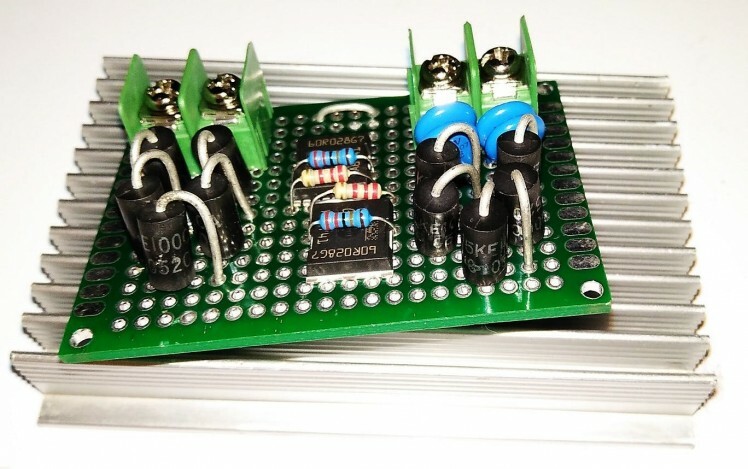 To create this voltage, first an XL6009 DC-DC boost converter is used to step up 5 volts to 12 volts. Then, B1212S isolated DC-DC converter is utilized to get isolated 12 volts from 12 volts output of the XL6009. 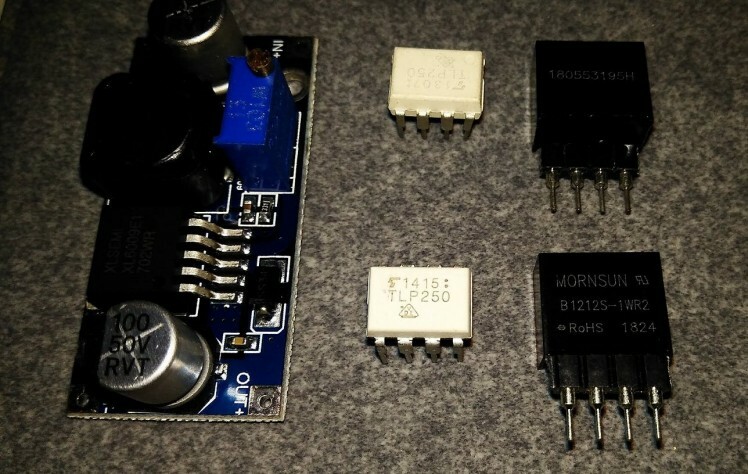 B1212S-1WR2 has a tiny flyback converter consists of switching element, tiny transformer and rectifier, which turns 12 volts into isolated 12 volts. This kind of isolation is magnetic isolation. This isolated 12 volts is supplied to power the TLP250 opto isolated gate drive IC. Inside this IC, there is an IR LED which can be turned on/off directly from 1.8/3.3/5.0 volts mcu pin through a current limiting resistor. The IR light will turn on or off the pull-push output drive transistors which will connect the gate drive pin to Isolated 12 Volts or Isolated Ground. If this voltage exceeds 650V, it will destroy CoolMOS instantly ! Therefore, it is necessary to suppress this voltage spike. One way to suppress this event is to use TVS diodes. TVS diodes are like zener diodes, except they can handle much larger voltages and power for a short period of time. They act in nano seconds and clamp down the transient voltage spikes. For this project, 1.5KE100CA TVS Diode is selected which has a withstand voltage of 85 volts, breakdown starts at 95 volts and clamp up to 135 volts. It's bi-directional, which means it can clamp on AC and reverse polarity DC too. 85 x 5 = 435 volts. For, 110 VAC systems, 3 TVS diodes should be enough and for 230 VAC, 5 TVS diodes are recommended. Ideal clamp voltage should be less than CoolMOS maximum allowable Vds but 20% higher than nominal supply voltage. MOVs can protect against transient events from lightning, large load swing, power line faults etc. In this project MOV 271K is used which has 175 VAC (rms) maximum allowable voltage with maximum clamping voltage of 455 VDC @ 25A. Since, this project is intended to be used with both 110/230 VAC systems, 2 MOVs in series is placed and two such strings are paralleled. It is recommended to use 5 TVS diodes in parallel with this 4 MOVs for amplitude clipping, because 2 MOVs in series has a higher clamping voltage than Vds of coolMOS. This kind of switching is knows as Soft Switching. Soft Switching reduces power loss on switching elements during switching transition because one of the component of power equation ( P = V * I ) is near zero. To perform Soft Switching, microcontroller needs to monitor the Zero Crossing Points on the Supply Voltage and Load Current continuously. This circuit will produce pulse train on every zero voltage crossing (ZVC) points and interrupt the mcu to inform the ZVC points. where, Tbtcp = Time between two consecutive pulses. Note that, the measured frequency will have some error due to pulse width and mcu execution delay. ACS712/758 series Hall Effect Isolated current sensor is a critical component for this project. This sensor can sense both AC/DC currents and represent the magnitude of the current with an Analog Voltage. When current is zero this Analog voltage is 2.5 volts. If a positive DC current flows through the sensor, this value will increase from 2.5 volts by the amount of mV/A sensitivity and vice versa. 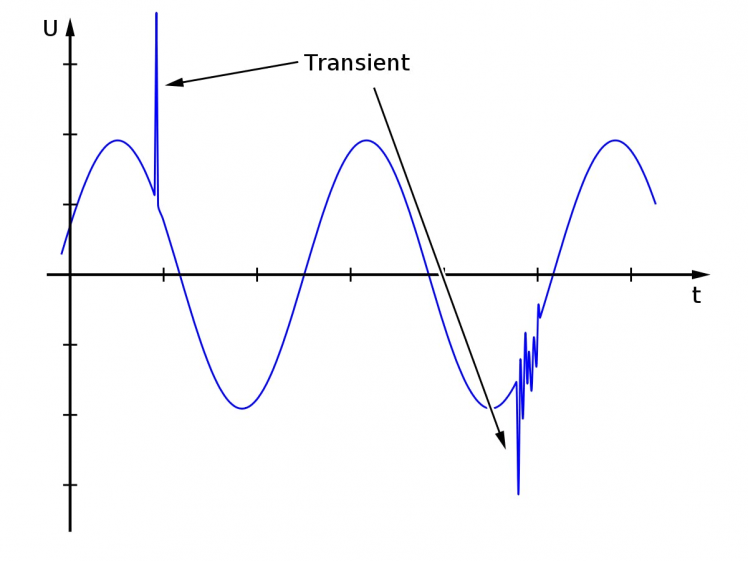 For AC current, the Vout will oscillate above and below 2.5 volts usually like a sine wave. In this project, ACS712-20A version will be used which has a sensitivity of 100mV/A. Thus, a 5A load current will yield 3.0 Volts (2.5+0.5) output. Short circuit fault must be dealt within micro seconds to protect CoolMOS and other electrical components (e.g. Supply & Load). 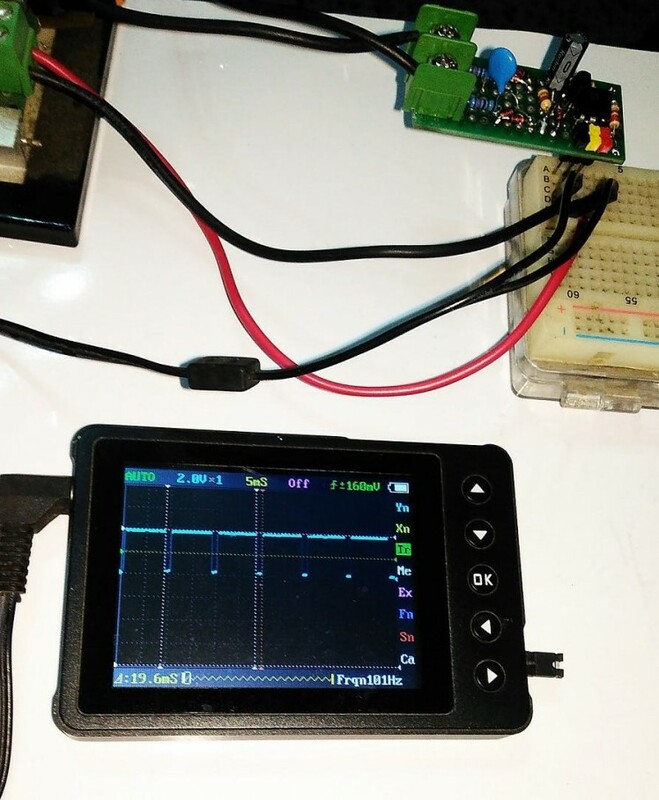 Using ADC to measure current is too slow for this purpose, because the system MCU might be busy updating display, fetching time data over I2C, measuring frequency etc. 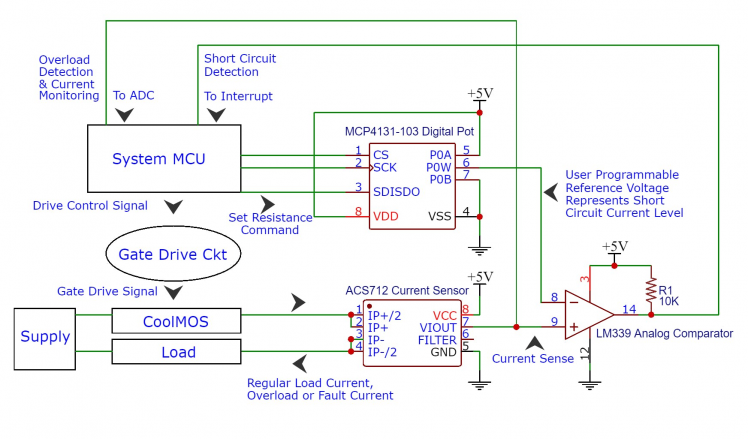 A short circuit event must override everything microcontroller is doing right now and immediately execute gate drive turn off routine, to clear the fault. The fault current setting must be programmable too, which enables this project usable for different types of applications. MCP4131 is a 7 bit (127 steps) digital 10k potentiometer (pot) programmable through SPI (Soft SPI) protocol from the system microcontroller. P0A, P0W, P0B pins of this chip are the legs of the 10k pot. P0W is the wiper pin, which sweeps between 0 to 10k with about 80 ohms steps. This sweeping is performed from the microcontroller by sending commands over SPI (in this case Bit Shift Soft SPI). P0A is connected to 5v and P0B to Gnd, this way P0W pin will output step voltages from 0 to 5000 mV in steps of about 40mV (5000/127 = 39.37). 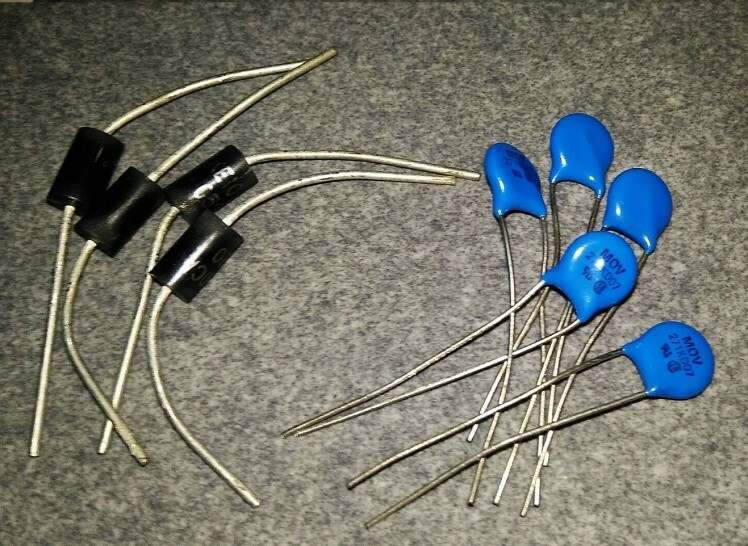 This P0W pin's voltage is the "User Programmable Reference Voltage" which is conneceted to the (-) input of LM339 Comparator. Now, (+) input of LM339 Comparator is connected to the Vout of ASC712 current sensor. 2.5 V + 2 A * 100 mV/A = 2.7 V and 2.5 V + 7 A * 100 mV/A = 3.2 V.
The MCU set the MCP4131 P0W pin's resistance such a way that it output 3.5 V. Under normal operation the Comparator will output LOW. If suddenly a Short Circuit occurs, the Vout of ACS712 will spike and make the Comparator go HIGH. 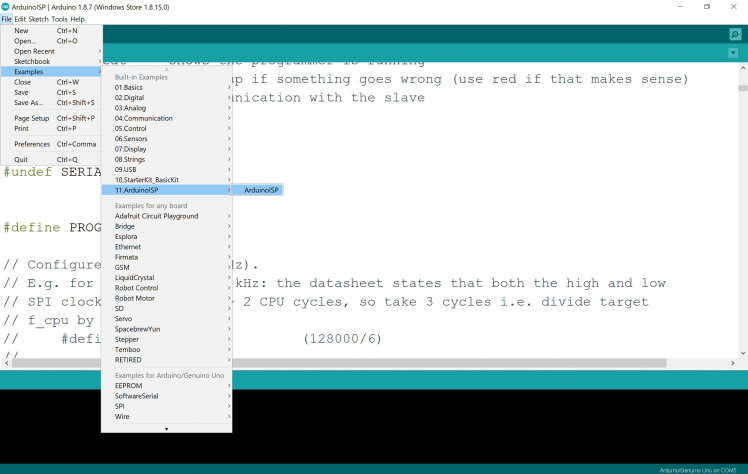 Comparator's output is connected to Hardware Interrupt Pin of system microcontroller. 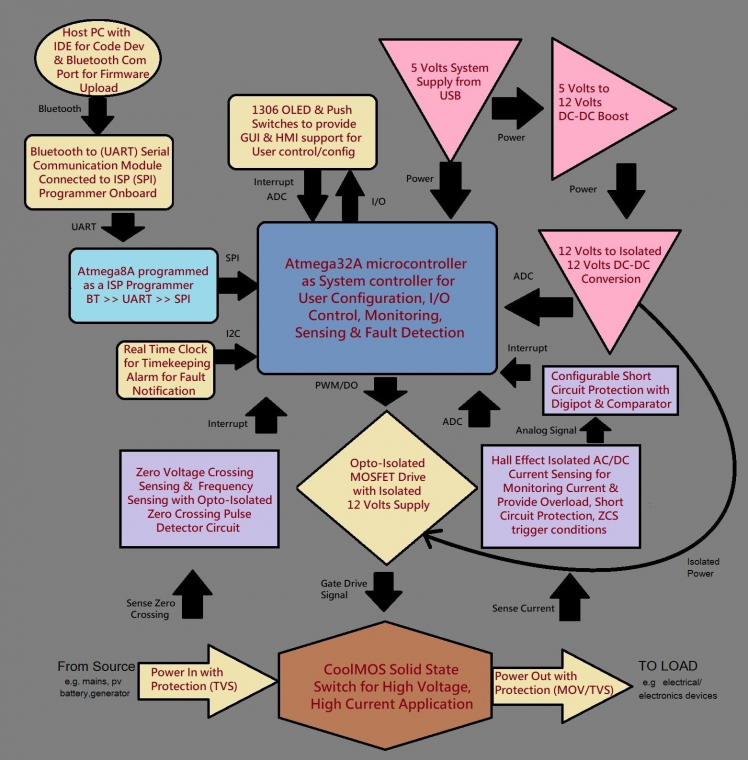 This Interrupt will cause the mcu to immediately turn off CoolMOS by disabling Gate Drive Signal. This is how the Short Circuit Protection works. As, for Overload and Current Monitoring, ACS712 Vout is also connected to the ADC, which will periodically check current for showing on display. User can configure the Fault Current, Overload Current according to application requirements. For higher current application ACS758 current sensor is a better choice but the 10 bit ADC of the mcu makes it difficult to monitor small currents with this current sensor. Following circuit may be used for ZCS purpose. Hysteresis might be necessary for window detection. It detects the current zero crossing by comparing the Vout of ACS712 current sensor against 2.5 Volts. Since, the Vout will swing above and below 2.5 volts for AC load (amplitude depends on load current). 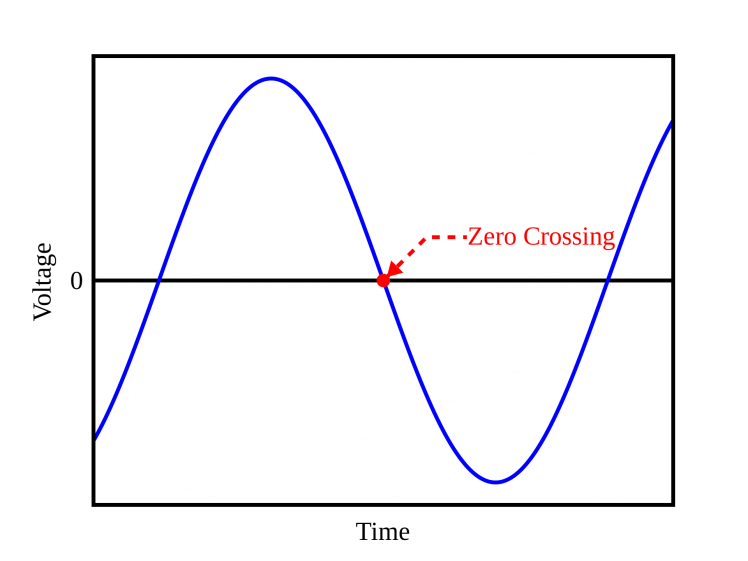 During, zero current crossing Vout will be 2.5 when both the comparators will output LOW making the output of the OR gate go low for a brief period of time. This output can be connected to an Interrupt enable input pin of the microcontroller to detect the zero current crossing point and perform ZCS operation. A note on AC current calculation : AC (rms) current is calculated by detecting the max/min (peak) current with the current sensor and dividing by sqrt(2). This method will work with sinusoidal load currents. 1307 RTC is a timekeeper chip, which can retain date & time information when the whole project is powered down. It only requires a 3V CR2032 Battery to keep going. It communicates with I2C protocol with the system microcontroller. As for alarm, a buzzer unit is connected to one the digital pin of the microcontroller. *** For this Project Atmega8A is used as ISP programmer instead of Atmega328P but circuit connection and ISP firmware is exactly the same. 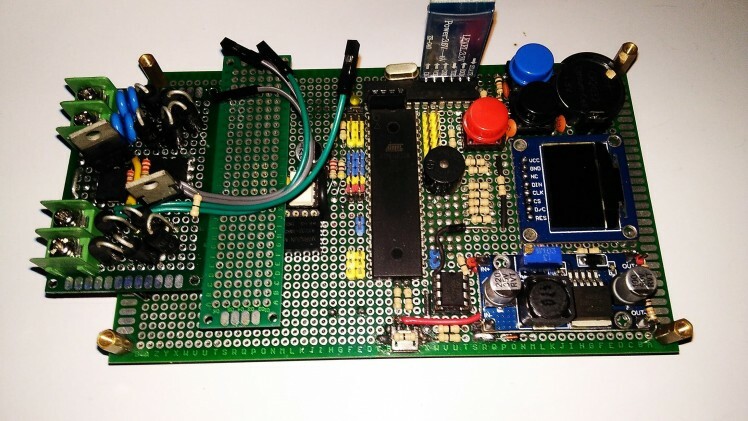 WARNING: THIS PROJECT DEALS WITH LETHAL VOLTAGE LEVEL AC/DC APPLICATIONS. THOSE WHO ARE NOT COMFORTABLE WORKING WITH LETHAL VOLTAGE LEVEL, IT IS ADVISED NOT TO REPLICATE THIS PROJECT. "Infineon Technologies" logo is the trademark of CoolMOS manufacturer, used to enhance coolness of the project. Reference Information used during this project development are added on references section. This is a "one size fit all" overkill design with bunch of protection features. For specific applications, certain elements of the circuits may not be required.